The arena of exchange-traded funds has seen rapid growth of low-volatility ETFs owing to the ability of investors to participate in the stock market upside while limiting the down risk simultaneously. However, low-volatility equity portfolios based on stable companies have been disappointing due to their hidden risks. A recent report released by Unigestion, a leader in the provision of tailor-made investment solutions for families and institutions, revealed that a large percentage of low-volatility stocks belongs to non-cyclical industries such as telecom and utilities. Low-volume stocks are characterized by short interest rates, which means that they tend to get risky if interest rates go up. High-volatile or cyclical stocks, on the other hand, exhibit a long interest rates profile that would be beneficial if interest rates increased. In the past, conservative trading sectors such as utilities and pharmaceuticals have been the most exposed to the risk of interest rates acceleration due to the non-cyclical demand for healthcare, utilities, telecom, and tobacco. Still, utilities suffer the greatest losses when interest increases because regulators tend to limit the prices they can charge, only adjusting the rates with a lag after the rising interest rates have eroded the profitability of utilities. The interest risk for a bond portfolio can be easily reduced because the sensitivity or duration of interest rates is directly related to the timing of cash flows, allowing bond investors to absorb the impact of rising rates by simply swapping out long for short duration bonds. The options for reducing high interest-rate risk, however, for stock investors are not very clear. The cyclical durable goods, business equipment, manufacturing, and energy sectors, on the other hand, usually move in a similar direction as interest rates. 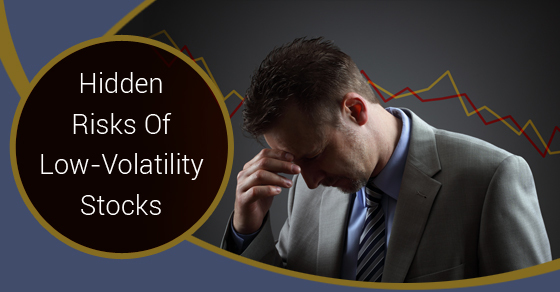 It is unfortunate that reducing past volatility is not sufficient to create a portfolio with low future downside risk, as past volatility can conceal some additional risks that are not self-evident in more conventional stock assessments. Additionally, research shows that portfolio diversification does not guarantee risk mitigation either. Rather, scrutinizing the structural interest rates risk implanted in an equity portfolio is critical, especially in portfolios built using past volatility estimates. Investors concerned about rising rates should try a moderation approach, like paring back on high-dividend strategies, though it is not a good idea to avoid dividend-paying stocks or limit high low-volatility strategies.